Beginning in 1962, secret U.S. military units, referred to as “Ghost Walkers,” operated clandestinely in North Korea. Their missions were so secret, in fact, the U.S. government refuses to acknowledge the experiences in the records of these black-ops veterans. One woman has spent years trying to correct her late husband’s military record to properly honor his service to the U.S. 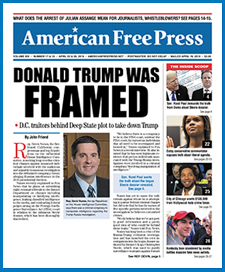 While tensions flare in the Korean Peninsula, American Free Press has learned of a clandestine joint military and intelligence unit that has been conducting brazen cross-border raids into North Korean territory since at least the early 1960s. The outfit, known as the “Ghost Walkers,” performed top-secret missions on North Korean soil, including infiltrating a nuclear power plant in 1963 and kidnapping a North Korean general straight from his camp, who was later interrogated and executed by the Central Intelligence Agency (CIA). Information on this unit is so classified that the men who served in it have been unable to prove so, as it is not listed on their service records, and they have been denied veteran benefits for over 50 years, including but not limited to treatment for toxic chemical exposure, i.e., herbicides like the defoliant Agent Orange. The main reason the Pentagon refuses to recognize the service and sacrifice of these vets is the fact that, in carrying out their top-secret missions, treaty and other laws were violated, which would create a diplomatic firestorm if revealed. The joint CIA-Army-Navy-Marines-Air Force unit operated out of South Korea from ASCOM City, near Inchon, and may still be functioning, although its top-secret nature precludes those without a need to know from confirming its existence. ASCOM, or Army Support Command, is a U.S. Army Materiel Support Center that “had its beginnings in the mid-1930s when the Japanese built a large supply depot and arsenal at Bupyong-Dong, Inchon City, to support their troops in Manchuria.” After the Japanese surrender at the end of World War II, Army Support Command Korea was established and acquired the acronym ASCOM. The wife of Oregon native Joseph Wayne Dunagan, one of the Ghost Walkers, who served in Korea from May 1962 to March 1964, reached out to this reporter with information she feels proves the unit’s existence. She explained how she began her quest over 15 years ago to force the U.S. government to honor its commitment to not just her husband but to all those who served in the unit. Dunagan was trained as a military policeman at Fort Gordon, Ga.
Barbara Ann Wright sat down with AFP for an exclusive 45-minute interview. Listen to AFP’s interview with Mrs. Wright by clicking the image below. In March of 1963, Army Intel asked us to go look at an atomic power plant up near the capital. We boarded a cruiser, Ghost Walkers with our counterparts the ROKs [Republic of Korea soldiers] and SEALs, and sailed west out of some naval port. After sailing all afternoon and at night and changing many directions, we approached the North Korean mainland. We offloaded into rubber boats not knowing how far inland the atomic power plant was. They stationed us every 100 yards, realizing that it was further inland than they thought. One of the SEALs came back and stationed us every half mile because it was 15 to 17 miles inland. “Injin” and three or four of the SEALs went into the atomic power plant through unlocked doors and took pictures of the control room and part of the working facilities. They saw nobody even though it was running full steam, noting that the lettering on the instruments [was] Chinese and Russian. Mrs. Dunagan explained how she learned about her husband’s connection to the ghost unit. “In 2001, he told me that he had a back injury and that he was getting no compensation for it,” she began, so they filed a claim with the VA. When they received Dunagan’s service record, they were shocked. “The first time I queried the CIA was 2004,” Mrs. Dunagan said, and she came up empty-handed. The same happened in 2006. Barbara approached her congressional representative in 2009, who was unsuccessful as well. Her luck changed when she paid a visit to her U.S. senator, Jeffrey A. Merkley’s office, where his new veteran’s representative was a second lieutenant in Korea in 1980. “She said her CIA contact said to send a FOIA [Freedom of Information Act] request to the CIA,” Mrs. Dunagan said, which she did—despite having had no luck in the past—but with a twist. “I had sent a separate request for confirmation of his service in the unit; I didn’t ask for confirmation that the unit existed since they never acknowledged that,” she explained. The FOIA response she received from the CIA, she believes, based on discussions with experienced veteran representatives, is confirmation that the unit existed, specifically because the CIA didn’t dispute her claims. She explained just how clandestine the unit was. “When those guys went to Korea, and there were 1,800 that left Fort Lewis 4 o’clock in the morning on May 6, 1962 out of McChord Air Force Base [now Joint Base Lewis-McChord, located nine miles from Tacoma, Washington], they left their dog tags, their military IDs, and all that stuff was sent home,” she said. “NUTS” is what the American Major told the German General in 1944 at the Battle of the Bulge. What I think of the Bureaucrats running our intelligence regarding the heroes who infiltrated North Korea and denied benefits is outrageous. If the United States government abandoned these CIA heroes, it can abandon anyone who serves. Gutless bureaucrats are in charge! “Best practices” for exposing top secret information has not been published and, therefore, calls for the question, “why have covert operations led to the abandonment of veteran’s benefits and violation of America’s promise to care for veterans? Perhaps this battlefield is not a frontal exposure of government wrongdoing.